Come for the mystery but stay for the characters. A good solid entry in the Meg Langslow series. Gone Gull is the twenty-first book in the Meg Langslow series. I have read every one of them within a month of their being published. Within the series, everyone ages and the plots build on one another so it is far better to read the series in order beginning with Murder with Peacocks. Even though this is a mystery series, I just love the characters. It is like visiting with old friends each time a new series entry arrives. 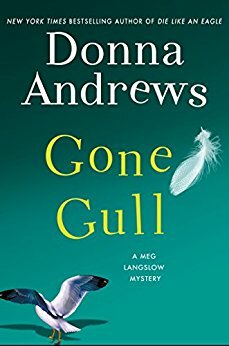 The mystery in Gone Gull, who is vandalizing Meg’s grandmother’s new craft center, is simple to solve. The subsequent three mysteries within the novel are not quite as easy. Again, it is the quirky characters and small town humor that keeps bringing me back to this series. However, this entry wasn’t as zany as usual so it deserves only 3 stars.